Whether you are ready to rock, enjoy being out at the airport, or have nothing to do on a Saturday night, Jasper County Airport‘s first ever Tunes on the Tarmac is the place to be. Scheduled for September 16 from 5pm- 7pm central, the inaugural event will feature family-friendly performances by singer David Nelms as well as In The Middle (band). With a suggested donation of $10+,100% of the admissions proceeds will go to support Mercy Flight of Indiana, a §501c3 non-profit organization that helps provide free air transportation for people with limited financial means needing treatment at distant medical facilities or other compassionate needs. Mercy Flight has touched many lives locally. Tunes on the Tarmac is intended to be a concert series benefiting charities with local reach. In addition to Mercy Flight of Indiana, Tunes on the Tarmac will support North Central Indiana Rural Crisis Center as well as Jasper County Recovery House with future concerts, depending on how September 16th goes. As an added bonus for attendees, Jasper County Fair Association will sell food concessions with those proceeds benefiting the Jasper County Fair. Food, planes, and music, what more could you ask for? 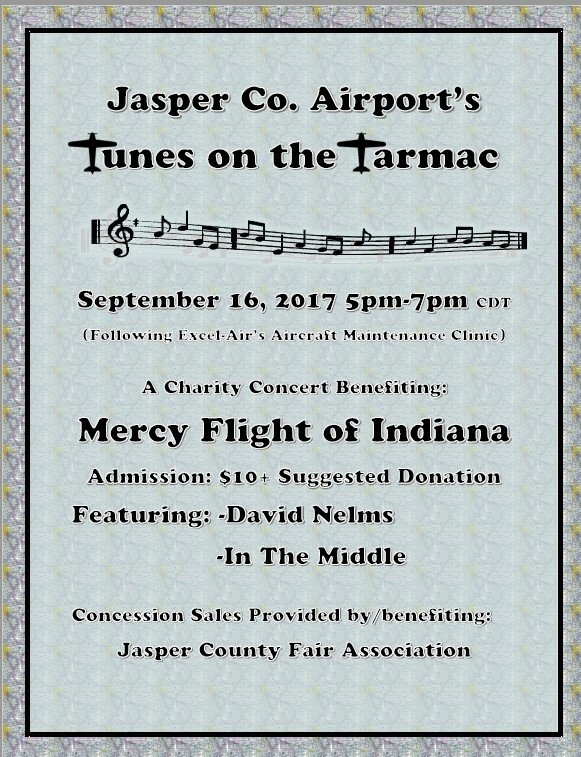 Please come support Mercy Flight, Jasper County Fair Association, your airport and your community on September 16th. We’d like to extend a special thanks to the performers for volunteering to have the proceeds donated to charity.